We’ve recently been contacted by numerous athletes regarding their Tommy John Surgery and the efficacy of the surgery, and what they could do to improve the likelihood of their successful return. I have personally sat in and observed multiple Tommy John Surgeries and been responsible for the athlete’s return to professional baseball. 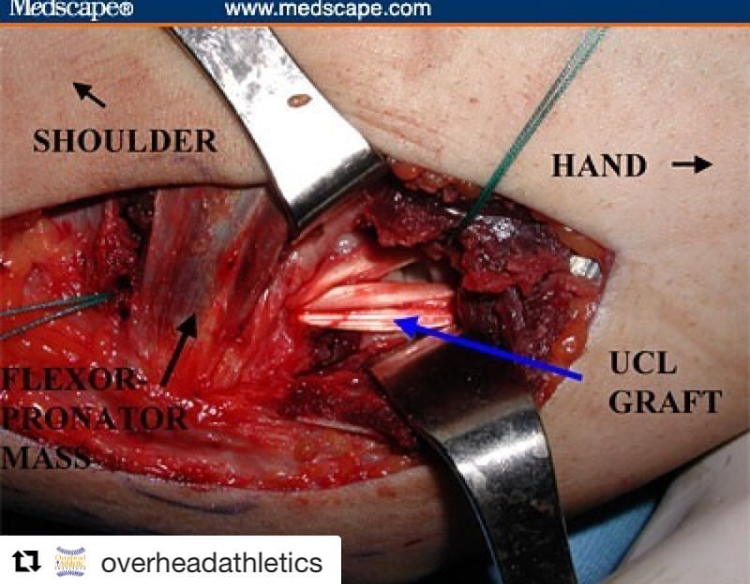 The transposition of the ulnar nerve and the graft replacement statistically has been relatively successful, I have spent hours analyzing video of pre and post operative throwers and it amazes me the ability of elite athletes to make infinitesimal alterations to their mechanics in the presence of pathology. The most important component of a successful return is to reduce the inertial moment of the throw and improve the position and fulcruming of the distal end of the humerus to avoid long lever valgus stress to the medial (ulnar) collateral ligament. If the distal end of the humerus is moving in the opposite direction of the distal end of the ulna and radius/wrist there is a summation of tensile and shear stress. When we work with our athletes recovering from this, our first issue is to address the position of the ball in relation to the elbow. I just saw a YouTube video of someone throwing off the mound for the first time post operatively and wondered whether or not this issue had been addressed. From analyzing the video I was nervous because this athlete moved well into external rotation with the ball outside of his elbow before his elbow moved in front of the scapular plane. That’s why it’s so important to understand the internal arthrological and ligamentous orientation of the throwers pitching elbow when working with these athletes. Maybe in layman terms? Since this is the “most important component” can you translate? The most important component of return is reducing the interial moment at the elbow or decreasing the amount of resistance/drag in the throw that directly impacts the UCL while altering the position of elbow to a more stable position. This can only happen if the athlete understands when and how to bring the ball closer to their center of rotation. Improper fulcrumming can present in many ways, often it presents with the ball being too far from the athlete’s center of rotation during the phase of maximum stress on the ucl. Thank you for your breaking it down. It sounds as if “short arming” is beneficial for combatting elbow strain. This would keep the ball close to the center of rotation, no? If it’s short at the right time, yes absolutely. Often when coaches and athletes think of short arming it only looks short because the elbow is also low. But to your question bringing the ball in closer is one of the most important components of reducing stress and strain on the shoulder and elbow. We have addressed this on our Instagram and YouTube videos a few times. Maybe I will make a post on it in here soon! This graph shows the astronomical increase in Tommy John surgeries performed on adolescents at the American Sports Medicine Institute (ASMI). As indicated, through the mid-1990s, 0% of TJ surgeries performed at ASMI were on adolescents. Within 12 short years, however, 44% of TJ surgeries performed at ASMI were on adolescents. From 0% to 44% is an astronomical increase. Mathematically, it is actually an increase of infinity (44 ÷ 0 = ∞). Something happened in the youth baseball world in 1995 that changed youth baseball forever. Perfect Game was founded in 1995. I’m skeptical of any one thing happening in any single year. Many factors play into this not simply perfect game. Radar guns began rising in prominence, MRIs and arthrograms became higher quality and more accessible to the everyday person, better surgical procedures with data supporting the return to play rates making surgeons more comfortable in performing it on youth, etc. Many factors, no doubt that some were improper training and overuse. It wasn’t one thing in a single year. It was what started in 1995 and grew into a national behemoth that spawned dozens of competitors and a year-round industry of travel tournaments and showcases. In fact, as the graph shows, the first TJs on adolescents at ASMI were in 1998 … three years after 1995. Sounds about right.